Will future courts order states to take down fish-blocking dams? A landmark decision this June from the U.S. Supreme Court upheld the rights of several tribes to hunt, gather and fish on the Northwest coast of Washington state, thereby ending a 50-year battle over Native American sovereignty and states’ rights. A narrow reading of this decision would focus primarily on fish counts and what the state of Washington will have to pay to remove close to 2,000 road culverts, impediments to fish migration. But a broader reading shows its real importance: Very few cases have come down the pike with more far-reaching implications for state governments. 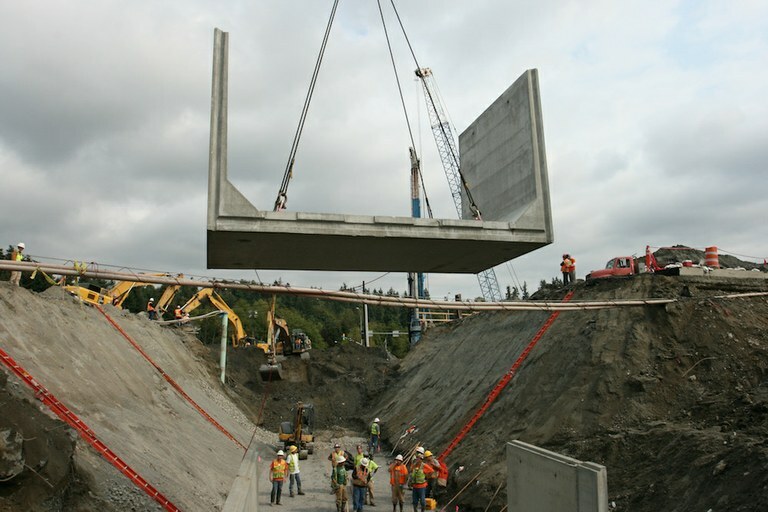 Workers lower a segment of a new, fish-friendly culvert into place in Bellevue, Washington, in 2012. Thanks to promises made to Northwest tribes in the mid-1850s by Isaac Stevens, Washington’s first territorial governor, no state has a more impressive record of losing legal battles with Indian tribes than Washington does. President Franklin Pierce sent Stevens to the region to negotiate with Native tribes and open the Oregon Territory to white settlement. The legal trickery Stevens used to accomplish those ends has come back to haunt lawmakers for generations. Stevens’ approach to ethnic cleansing eventually led to war with the Nez Perce, the Umatilla and the Yakama tribes, while some of his other treaties led to century-long battles in federal courts. To their credit, our nation’s founders anticipated these conflicts and designated treaties “the supreme law of the land” under Article VI, Clause 2, of the U.S. Constitution. This solemn trustee-guarantor partnership between tribes and the federal government has been the backbone of federal Indian law ever since 1832, when Chief Justice John Marshall’s “trust doctrine” made it the federal government’s fiduciary responsibility to safeguard the rights and resources of treaty tribes, trumping all other obligations. Washington’s legal battles began with United States v. Winans in 1905, over the Yakama Nation’s treaty right to hunt, gather and fish in their “usual and accustomed place,” which happened to be owned by white people. Fast-forward to today, and the just-decided culverts case resolves litigation that began almost 50 years ago, when Washington state Attorney General and future Republican Sen. Slade Gorton challenged the scope of the tribes’ fishing rights, hoping to extinguish them forever. As in the Winans case, Washington state’s 1970 lawsuit relied on states’ rights to carry the day. Attorney General Gorton raised three questions about the Stevens treaties. Did they guarantee the tribes a percentage of the annual commercial catch? Are hatchery-bred fish included in that percentage? Finally, did Native rights implicitly include protections from environmental degradation that would render the tribes’ fishing rights useless? The now-famous 1974 Boldt Decision answered the first question by guaranteeing tribes half of the commercial salmon catch. The second answer was easy: The allocation could not be limited to hatchery-raised fish. The third question was bandied back and forth in courts for decades. In the end, it proved to be the state’s undoing. The cost for removing those culverts and other impediments to fish migration could run into the billions. Headlines in newspapers will doubtless focus on the dollars and the fish counts, but the beating heart of this case lies in its willingness to ask if states could be held responsible for safeguarding Native-owned natural resources protected by treaties. The 9th Circuit Court of Appeals answered in the affirmative, and the Supremes let that ruling stand, saying to Washington state, in effect: You should have taken the Boldt Decision seriously and prepared remedies for all these treaty violations before the salmon became a protected species. Don’t blame the tribes for your failure to live up to your obligations. Now, the question no state wants to ask is how will future courts divine the difference between the culverts that stop fish from reaching their breeding beds, and all the dams that do the same thing?